The term ‘biobased’ means that the material or product is (partly) derived from biomass (plants). Biomass used for bioplastics stems from e.g. corn, sugarcane, or cellulose. Biodegradation is a chemical process during which microorganisms that are available in the environment convert materials into natural substances such as water, carbon dioxide, and compost (artificial additives are not needed). The process of biodegradation depends on the surrounding environmental conditions (e.g. location or temperature), on the material and on the application. The property of biodegradation does not depend on the resource basis of a material but is rather linked to its chemical structure. In other words, 100 percent biobased plastics may be non-biodegradable, and 100 percent fossil based plastics can biodegrade. Bioplastics are driving the evolution of plastics. There are two major advantages of biobased plastic products compared to their conventional versions: they save fossil resources by using biomass which regenerates (annually) and provides the unique potential of carbon neutrality. Furthermore, biodegradability is an add-on property of certain types of bioplastics. It offers additional means of recovery at the end of a product’s life. Download the Fact Sheet of European Bioplastics on What are bioplastics? 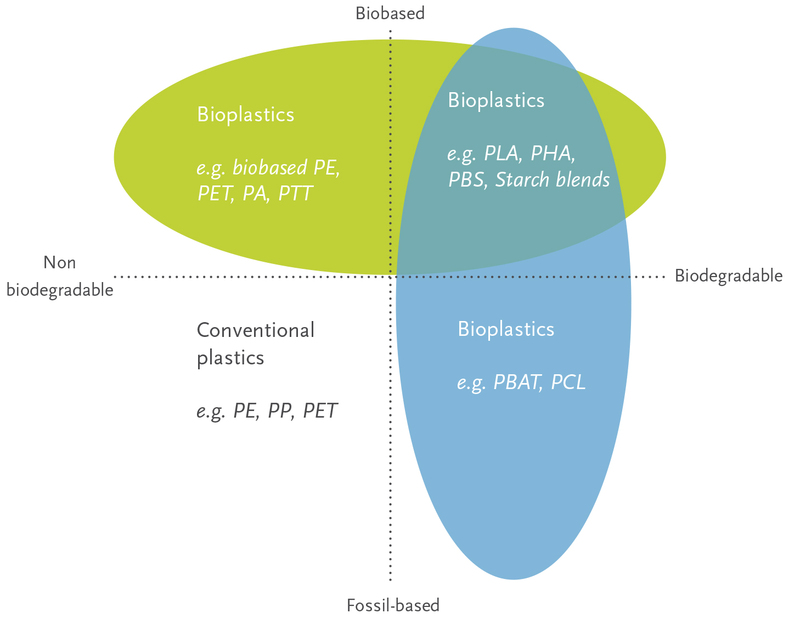 Text and image: European Bioplastics.